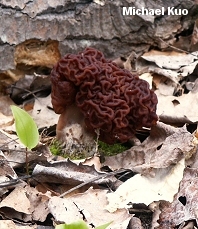 Gyromitra esculenta is a beautiful springtime mushroom that is often encountered by morel hunters in northern and montane areas of the continent. 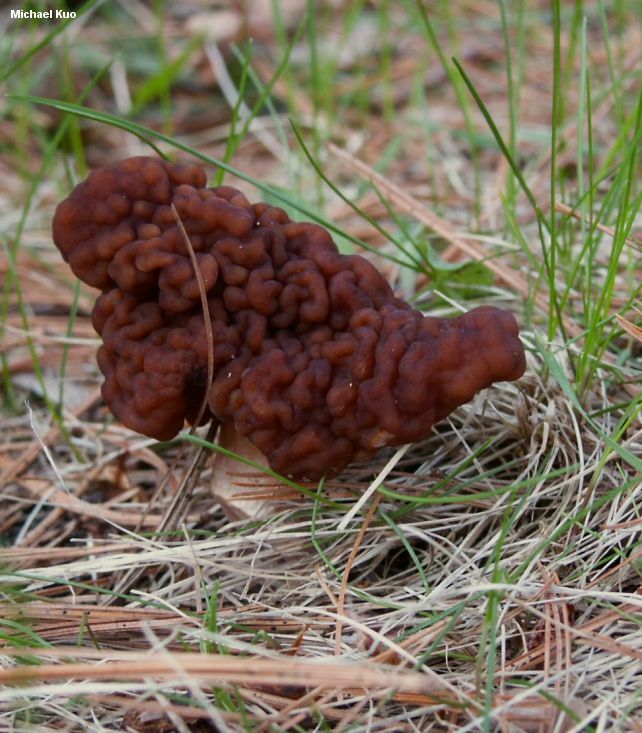 It can be distinguished from other species of Gyromitra by its convoluted and brainlike, reddish brown cap, and by the fact that its stem is not massive in proportion to its cap. In dry weather conditions, Gyromitra esculenta can blacken and dry up--and last for an amazingly long time on the forest floor. Ecology: Officially saprobic, but potentially also mycorrhizal--or, like the true morels, donning both ecological hats in the course of its life cycle; found in spring, primarily under conifers; widely distributed in northern and montane North America. 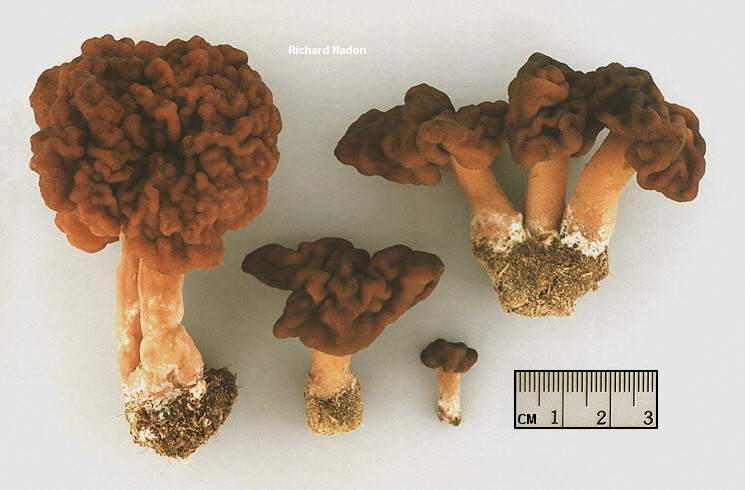 Cap: 4-8 cm high; 3-12 cm wide; irregular and convoluted in shape but generally brainlike and often somewhat lobed (but usually not saddle-shaped); wrinkled; bald; pinkish tan to reddish brown, becoming darker or nearly black in age and in prolonged sunlight; undersurface not generally exposed, close to stem, tan to whitish, finely mealy. 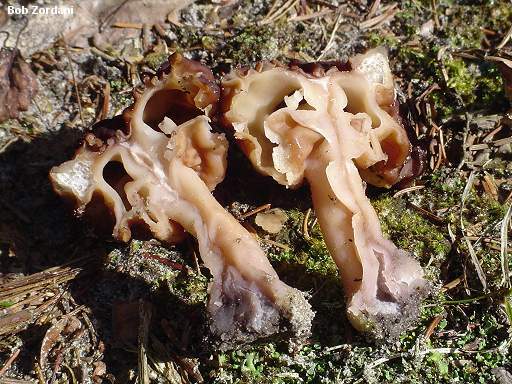 Flesh: Thin; brittle; whitish to tan; slight or chambered. 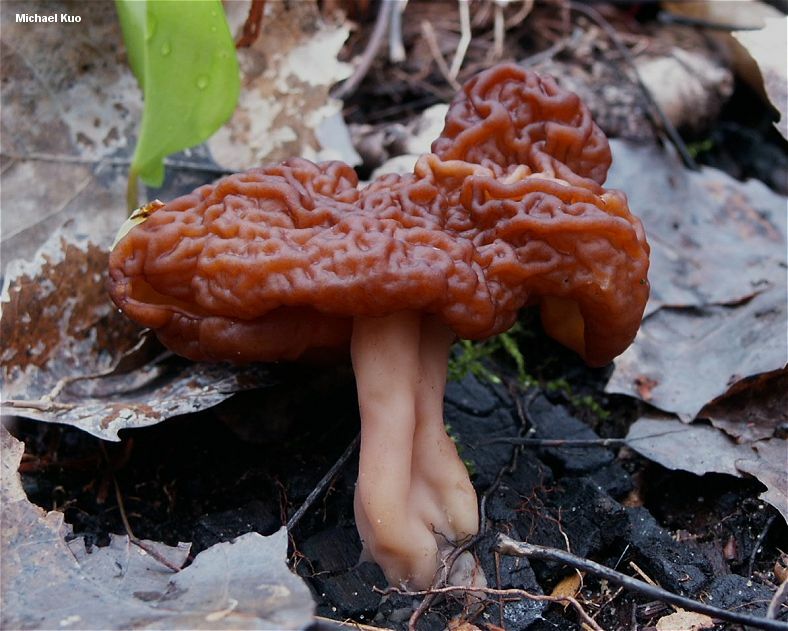 Stem: 3-9 cm long; 1-3.5 cm thick; pale yellowish tan to rose to tinged like the cap; usually roundish in cross-section but frequently folded into a figure eight cross-section; bald. 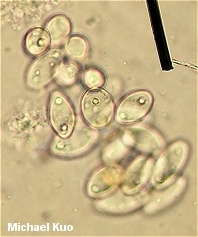 Microscopic Features: Spores 19-28 x 10-13 µ; smooth; fusiform or nearly ellipsoid ; usually biguttulate with two small droplets but occasionally uniguttulate or multiguttulate. Asci 8-spored. 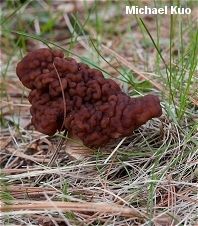 Paraphyses clavate; 4-10 µ wide; reddish to reddish orange. REFERENCES: (Persoon, 1800:Fries, 1822) Fries, 1849. (Saccardo, 1889; Smith, 1975; Smith, Smith & Weber, 1981; Arora, 1986; Phillips, 1991/2005; Lincoff, 1992; Weber 1995; Abbott & Currah, 1997; Evenson, 1997; Barron, 1999; Roody, 2003; Kuo, 2005; McNeil, 2006; Miller & Miller, 2006; Trudell & Ammirati, 2009.) Herb. BPI 83062902/566942. Herb. Kuo 05249503, 05249704, 05110301, 05130305, 05110501, 05160501, 05230502.